Preheat oven to 350F. In a small bowl, mix together the egg and 1/4 cup of Pasta Sauce. Unroll dough onto baking sheet lined with parchment paper or cooking paper. Sprinkle cheese on dough, leaving in 1-in. around the edge. 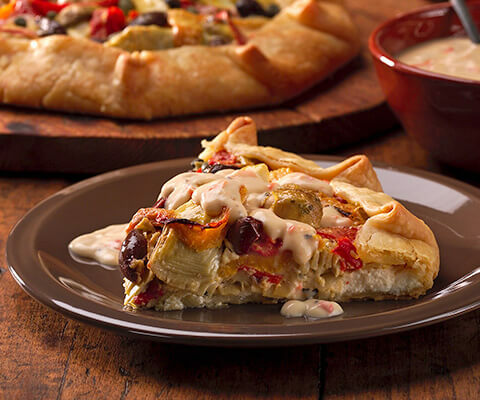 Layer the peppers, olives and artichoke hearts. Sprinkle capers on top and carefully spoon egg mixture over filling. Gently fold crust over the edge of the filling, forming pleats as needed. Lightly coat crust with nonstick cooking spray for a more golden color if desired. Bake uncovered for 40 to 50 minutes, or until crust is golden brown. Allow to cool for 5 minutes before slicing. Meanwhile, in a medium saucepan over medium heat, warm remaining Pasta Sauce until heated through. Slice galette into 6 wedges and serve with warmed Pasta Sauce. If desired, substitute Classico® Roasted Red Pepper Alfredo Pasta Sauce with Classico® Creamy Alfredo Pasta Sauce. TIP: For a lighter version, substitute 1/2 lb. of goat cheese with a mixture of 1/2 cup of goat cheese and 1/2 cup ricotta cheese.